He was the vassal considerably trusted by Kagetora and was skilful in war. He always was in the van of the attack. But it is said that he made a great achievement in domestic administration also recently. He has some legendary episodes and some say that he never married though he had a wife and sons. 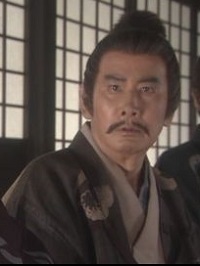 And others say that he betrayed Masatora (Kagetora) and was executed but he is said to have died of illness in reality. In this series, he supports Kagetora and doesn't get on well with the former vassals of the Uesugi clan as ŌKUMA Tomohide. He puts an end to the life of TAKEDA Nobushige in the Fourth Battle of Kawanakajima. He served NAGAO Harukage, elder brother of Kagetora at first but then served Kagetora who was more talented than his brother. He taught him stratagem and became one of his important vassals and participated in some battles. In this series, he is described as a man who is loyal to Kagetora but opposes Ōkuma Tomohide, like Kakizaki Kageie. Like his father Masahide, he served the Uesugi clan and was charge in tax payment but he served the Nagao clan later. 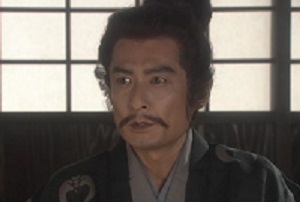 But there was an internal struggle in the clan and he betrayed Kagetora and served the Takeda clan and obeyed TAKEDA Katsuyori until his death in 1582 and they shared the same fate. 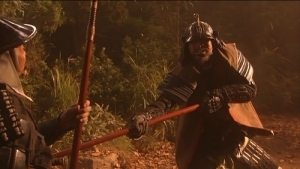 In this series, he betrays Kagetora with the help of YAMAMOTO Kansuke and SANADA Yukitaka. He participates in the Fourth Battle of Kawanakajima and offers two vassals of Shingen (*) sake before departure for the front. (*) Akira Senju who was in charge of music and Kōji Kaminuma who wrote the title played the roles of the vassals. NORIZUKI Gennojō is a komusō, a meidicant Zen priest of the Fuke sect though he is a son of hatamoto, direct vassal of shogun in reality. In Edo, he meets a man called Araki, vassal of MATSYDATIRA Sakyōnosuke、Kyoto Shoshidai who governs Kyoto under Tokugawa shogunate. He orders him to search Yoami in Awa (current Tokushima) and receives money. But Mikaeri O-Tsuna, a cut-purse sees it and plans to steal it. That night she waits for him near a bridge but Gennojo fights SEKIYA Magobei, a street-murder with swords. Then O-Tsuna throws a stone into a river and the noise makes him away. She steals Gennojo's money but he is aware of it and says, "I pretend I didn't see it". Gennojō is a fiance of Chie, daughter of Kōga Yoami, a Kōga-ryu ninja who is the head of the Koga family. Years ago, he decided to travel to perfect his skill in swordsmanship with his instructor TOGASAKI Sekiun and was given an amulet by Chie. And in Kyoto, an aristocrat attempted to overthrow shogunate and it was found out and he was arrested by Kyoto Shoshidai (Hōreki no hen). The aristocrat hid himself in Awa and Sakyonosuke ordered Yoami to search a petition with blood sealed of overthrowing shogunate called "Naruto Hichō". Yoami departed for Awa but visited a O-Tsuna and her mother O-Sai on his way. He gave O-Tsuna some money but Toragorō, father of O-tsuna who was a rude man took away it. "the swordsmanship is a means of killing people and if you investigate the swordsmanship thoroughly, he will be a brute." And then he died. After that Gennojō becomes got disheartened but was told by a prostitute with him that a brute could have human mind by chanting the name of Buddha. O-Tsuna is chased by Mankichi, hired thief-cather who knows about Gennojō well and his follower Gingorō but makes her getaway. Then she sees Magobei and gets falsely accused by him. She tells him to visit a house in Hongō Tsumagoi, an area of Edo. Gennojō is persuaded to meet his father who takes ill and Chie by Mankichi and Gingorō at an eating house managed by Mankichi's wife. They grieve that Gennnojo degraded himself. And in the residence of Yoami, Chie is sick of waiting for her father and Gennnojō but is admonished by TABIKAWA Shūma, leading disciple of Yoami. He has a secret design in reality. O-Tsuna's family is very poor and her younger sister and brother do street performance to earn their keep. She knows that Toragorō will sell her to Yoshiwara, a red light district for money and that's why she keeps a distance from her family. She gives them the money she stole from Gennojō and tells them that she is a maid of a big residence. And she remembers that in her childhood, she stole a merchant's purse at an exhibition of medicines by HIRAGA Gennai. Then a boy of a samurai family appeared and said to her "I pretend I didn't see it" to protect her. She thinks that the boy was possibly Gennojō himself. Then she goes to Hongō and is squeezed by Magobei who waits for her. But she holds a pistol and sends him away. Gennnojō visits Chie with Gingoro but is refused to see her by Shuma who says she has depression. 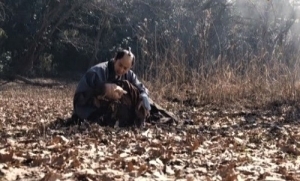 Then Gennojō asks him to hand her the amulet. Chie feels that somebody visits the residence but Shūma tells such a lie that it was Gennpjō but he said that he didn't want to see her anymore. Shūma attempts to marry her and manage the Kōga family. He orders his follower Taichi to keep a lookout for him. Gennojō and Gingorō who leave the residence are attacked by the ninjas of Kōga-ryū. Though they cut their way, the life of Gennojo is threatened by the samurais of Awa also and O-Tsuna suports him with her pistol. In Awa, Yoami is put in a jail. The Koga family goes into decline. The images are from the video of "Naruto Hichō". UESUGI Masatora is angry with NARITA Nagayasu who sees his parade after succeeding the position of Kanto Kanrei from his horsebeck. Then Masatora forces him get off from the horse and hits him. As a result, Nagayasu withdraws troops from the headquarter of Masatora with other rulers though his wife Ise still remains there as hostage. Masatora says that he was rude to him and Ise but she says that she will suffer for her husband's betray but won't pay for his impoliteness. She declares that his ancestor exchange salutes with Minamoto-no Yoshiie (*) from his horseback and other rulers didn't betray Masatora but abandoned him. Besides she blames him why Kagetora who venerates Vaisravana doesn't understand other people's feelings and "Heaven's judgement" he says is nothing but his self-conceit. Masatora stops Kakizaki Kageie who tries to slash her and receives her words as a valuable lesson to him. Then he learns that TAKEDA Harunobu takes up arms and retreats to Echigo. 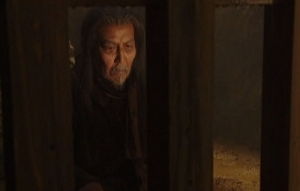 He sends Ise to Oshi Castle to stop Nagayasu from supporting the Hojo clan by gaining his gratitude. In May 1561, Warigatake Castle falls but Hara Toratane who is wounded becomes unknown. 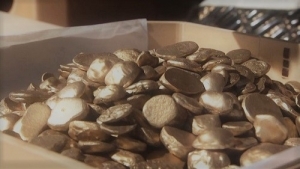 and Denbée is given three handfuls of gold nuggets as a reward for having incited betrayers during the attack. At Odawara castle, Hojo Ujiyasu treats his vassals to sake and grilled seafood to celebrate the retreat of Masatora. 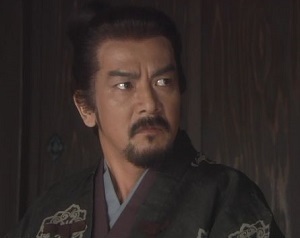 SHIMIZU Yoshimasa appreciates the attack of Harunobu but Ujiyasu tells him that he will be his enemy someday. Then he sees a grilled clam and says. At the same time. SANADA Yukitaka talks about the battle at Kawanakajima is coming again. he says that Harunobu cannnot beat Masatora by stratagem. Then KAWAHARA Takamasa appears and tells him about the death of NAGANO Narimasa. Kansuke introduces Ritsu to KASUGA Toratsuna and he is pleased with Ritsu. But he is not keen to succeed Kansuke. Then he advises Toratsuna if they have some sons, one of them can revive the family. In Echigo, Masatora teaches his nephew Unomatsu (later Kagekatsu) calligraphy. Momo hime who sees it thinks that he has changed. Masatora says that he knows how to express affection. Heizō comes home and make his family prepare for the battle. Hisa persuades him that he should return again. On the 14th of August, Masatora and his army departs for Kawanakajima but only Heizō looks depressed. It is signaled to Harunobu by beacon and he gathers his vassals to hold a council of war. 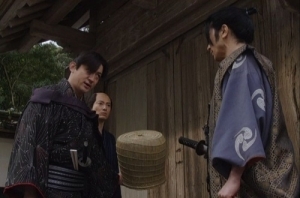 He asks Kansuke whether Toratsuna can hold Kaizu Castle or not. "The castle never falls, sir,"says he. (*) A samurai from Minamoto clan who suppressed eastern Japan in the 11th century. (**) It's a play in words. The word kai means the province ruled Harunobu and a Japanese word that means shell or shellfish. And the word "foxy" is expressed "kuenai" in Japanese and the word also means "unsavory". Ujiyasu attempts to say that Harunobu of Kai is foxy and he is like a shellfish that is unsavory. "Idaten ~ Tokyo Olympic Hanashi" and "Kirin ga Kuru"
I think that you know, the Taiga Drama Series "Idaten ~ Tokyo Olympic Hanashi" will be broadcast next year. It describes the lives of Shisō Kanaguri, a marathon runner who participated in the Stockholm Olympics and Masaji Tabata, a swimming coach who realised hosting the Olympic in Tokyo. It is written by Kankurō Kudō. 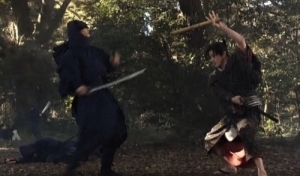 The role of Kanaguri is played by NAKAMURA Kankurō VI and Sadao Abe acts as Tabata. And the series in 2020 was announced last week. It is titled "Kirin ga Kuru" that describes the life of AKECHI Mitsuhide, vassal of ODA Nobunaga (*). "Kirin" is used as a Japanese translation of giraffe. But in this case, it is an imaginary animal that appears when a good ruler governs the country (**). It is written by Shunsaku Ikehata who wrote "Taiheiki" in 1991 and Hiroki Hasegawa plays the leading part. (*) His letter that says the reestablishment of Muromachi Bakufu was found last year. (**) The animal is a trademark of KIRIN BEER, one of major beer companies in Japan.